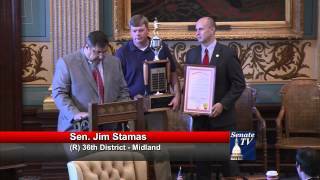 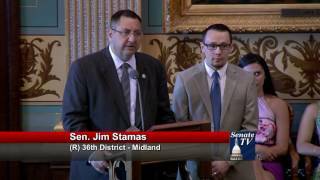 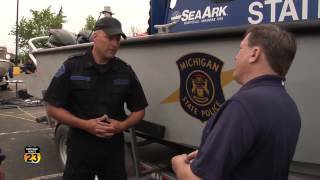 Senator Jim Stamas, R-Midland, honors his staff member Eric Somsel for his years of service to the Michigan Senate during the June 1, 2016 session. 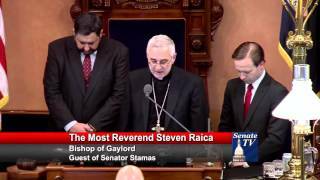 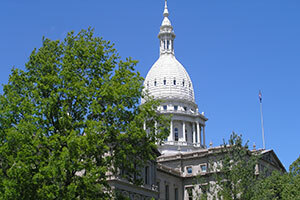 Senator Jim Stamas, R-Midland, welcomed The Most Reverend Steven Raica, Bishop of Gaylord, to the Michigan Senate to deliver the invocation at the start of the February 23, 2016 session. 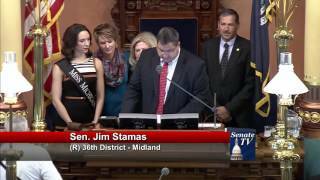 Senator Jim Stamas, R-Midland, welcomed 2015 Miss Michigan winner Emily Kieliszewski of Alpena to the Senate floor.